You need a new website or refreshing the existing one and enrich its functionalities? We are the team you need. 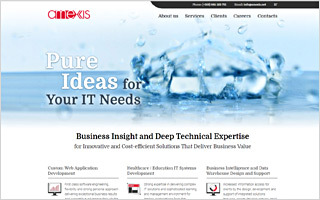 We design, develop and maintain websites. You want to increase your organization visibility and recognizability? We can develop your visual identity and help you increase people awarenes of your business, products, and services. Your website needs up-to-date, consistent and relevant content? We can create content that informs, promotes and sells and fully meet the needs. Regarding our collaboration with DesignMeWeb I can only express my superlatives. All in the team are very responsive, accurate and keep all agreed deadlines. It is also easy to work with a team like theirs. I can only recommend working with them, you will not be disappointed. "Conix Trade" recommends DesignMeWeb to anyone who needs quick, quality and innovative development of website. Our excellent professional collaboration was accompanied by patience, responsiveness and understanding of their entire team.